So far we've found fifteen cents and it's not even 10:30am! 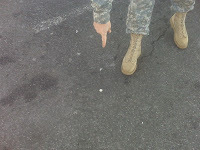 Here is a picture of the nickel found in the parking lot of Dunkin' Donuts- hubby picked it up. Today we have a camera crew coming over to film us in action :) More details to come later! Update: Found an extra fourteen cents while hanging out with Terence Burke and his crew. We are so excited that the world is curious about our experiment! And to think.. it all started with seven cents! Today's weather made it impossible to find any change- and so there's none to report today. The RX: 100 Crunches daily x 100 days= no more cravings for cigarettes? 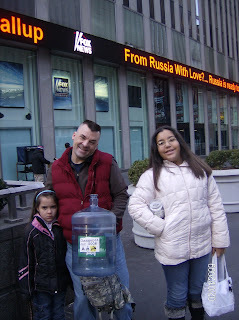 Today we were interviewed on Fox News Channel here in New York City about this blog. 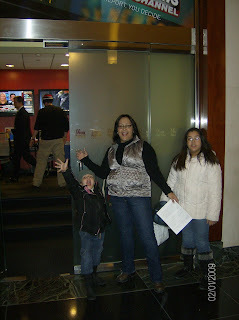 Our children had an amazing time and we got to see live television in action- wow! The change today was picked up by Clayton Morris (co-host) during a teaser segment with co-host Alisyn Camerota. Here are a few pictures we took en route :) It was SOOO EXCITING!! In all our excitement, we forgot to mention the name of our blog lol. Hubby did a search and found multiple links under 'Family Collects $1,000 Worth of Spare Change'. Hubby and I were discussing the recent publicity generated by our family's odd little hobby and look upon it with mixed feelings. A large majority of people feel that picking up change found in the street is a sign of financial hardship, too much spare time, or simply put- a social faux pas. What started more as a social experiment has now become something considerable. Imagine finding a thousand dollars in the street. What would you do with it? Pay a bill? Splurge on something you'd otherwise not buy with your hard earned cash? We here at the changepot have not spent the money we've found nor intend to do so. Our children are very proud of their additions- their found coins in the playgrounds, on the sidewalk, etc. Also, we do not rush to pick up dropped coins nor bowl some old lady over to pick up her freshly dropped dollar. Quite simply- we bend over to pick up coins, bills, and broken gold jewelry already dropped. You'd be surprised how many people walk over money without a forethought. How many times have you walked over a folded dollar bill discarded carelessly in front of automated sliding doors at the supermarket? Last year alone, I found eleven dollars - a ten and a one - just by glancing ahead of me. Coins? They're everywhere. What sets the Changepot, Found Money, and other people who retrieve change aside from the local population? We document our change finds in blogs and share our joys in obtaining it. This is an important time in our lives - a new president ( I can't believe he's got a myspace profile! ), a new way of thinking. Pay attention to your surroundings ladies and gentlemen. Perhaps Change is Good after all? Add another penny to the pot- and a warm hello to our good friends on this chilly Winter day! Today we found a total of $0.45 in the form of a quarter, dime, a nickel, and five pennies even. We also found a smaller coin that turned out to be a 1982 1 cent piece from the cayman islands. All of the coins were found at the food court of the Staten Island mall- apparently the crowds are getting a little looser with change (that's always a good thing!). P.S. Today's total reminded me of this concert footage- Wow..1987! Where were you when this came out?? Found a dollar, a dime and a penny while running errands in this bitter cold weather! This is a very odd total of found change but hey- i'll take it! The dollar was found inside a costco shopping cart (where we did most of our grocery shopping for Sunday's football games). The dime and penny were also found during the same outing. Hubby and I bought tickets to go to a supercool event happening at RCMH at Costco (you may want to check it out) : Chinese New Year Splendor. I'm so happy that people are starting to realize just how much we tend to overlook change on the ground. This blog isn't just about the change I find- it's about how you can change your situation with a little positive thinking and alot of faith. Are you ready to make a change? Leave me a message and tell me how YOU plan on changing today? Q: Wow, what you're doing is so awesome. I have a question for you: What is the dirtiest coin/piece of money that you found? And would you go great lengths to pick up a horrendously dirty penny? A warm welcome to those who are coming over from our local news articles posted today in The Daily News and NBC New York. My family and I are very excited to see all the attention our changepot has generated in the past three and a half years! My daughter Brianna has now decided to take over the daily accounting and posting for the changepot (a habit I highly encourage). Now back to how we got here in the first place: the totals. On Friday we found two very cold pennies in front of our house. The weekend drill at hubby's job brought us three dimes.one nickel, and two pennies. Today my daughter found fifteen cents in the form of a dime and a nickel in the school yard and hubby found a quarter, a dime, and a nickel (in that order) while getting us three copies of the Daily news today. While we haven't found a dollar yet since the new year began, I am quite optimistic though something tells me we'll have some new competition in the change finding scene with all the new hunters turned on to the idea that yes, you can accumulate quite a bit of change if you pick up that penny. I say the more the merrier! 5> The Godiva Pretzel nickel: Hubby's famous words: " Are we supposed to eat this chocolate or wear it?" 4> The Christmas subway finds: God Bless the creators of Purell!! 3> The Mall sink penny: One of the cleanest pennies i've found thus far. Again, purell... merci beaucoup! 2> The Quarter that got away: While we didn't get to take this quarter, it was nice while it lasted. 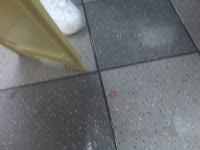 The quarter was right next to a chic sandal wearing hippie at a bay ridge Dunkin' Donuts. The fact that the man came out in sandals during a snowstorm was crazy enough. 1> The not now penny: Ever run into someone that you don't want to talk to and they distract you enough to make you forget what you were doing in the first place? Fortunately I ditched her and grabbed the penny by her foot and made my way outside the supermarket. Sometimes it's not that easy getting away lol.